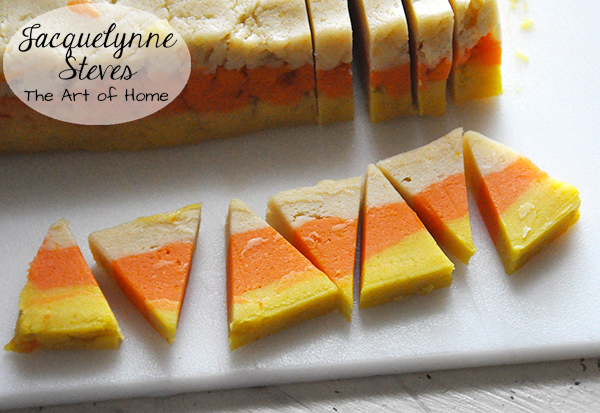 How fun are these Candy Corn Cookies? No, there aren’t any actual candy corns in the recipe… but they look just like giant candy corns, right? 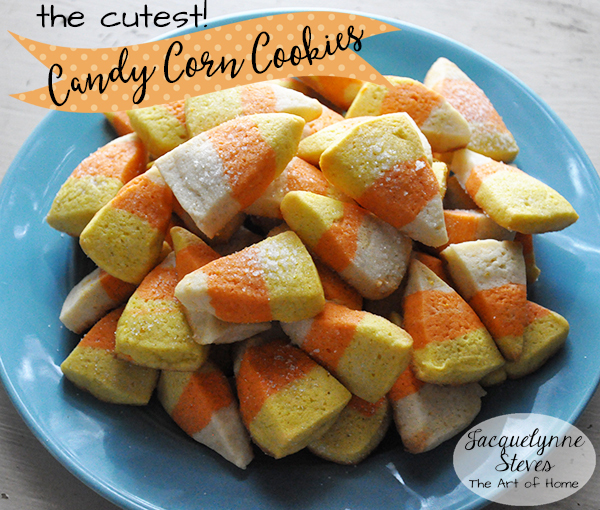 I made this Candy Corn Cookies Recipe a few years ago, and just pulled it out the other day. The kids and grandkids will love to help with these, and they will be the hit of any party this season! Line bottom and sides of a 9×5 inch loaf pan with wax paper or plastic food wrap. Set aside. Combine butter and 1 cup sugar in large bowl; beat at medium speed until creamy. Add egg, orange juice, orange zest and salt. Continue beating until well mixed. Reduce speed to low; add flour and baking soda. Beat until well mixed. Divide dough into thirds. Press one-third of white dough evenly onto bottom of prepared pan. 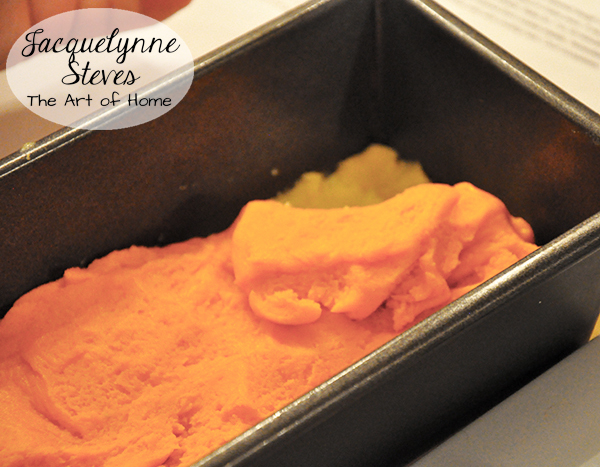 To one-third of the remaining dough, add small amount of orange food coloring, mix until color is well blended. 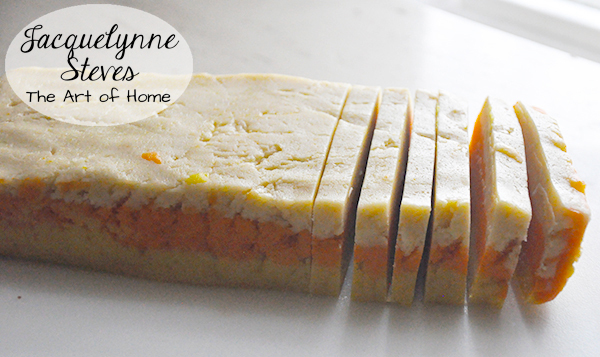 Press orange dough evenly over white dough in pan. 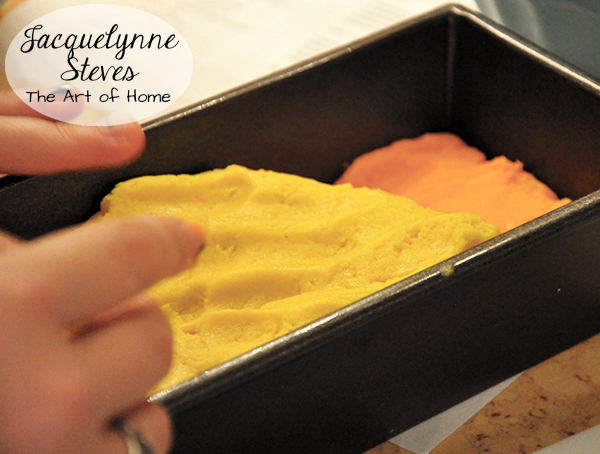 Add yellow food coloring to remaining dough and press over orange dough in pan. Invert loaf pan onto a cutting board to remove dough. Peel off waxed paper. Cut loaf crosswise into 1/4 inch slices using a sharp knife. Cut each slice into 6-8 wedges. Place cookies 1 inch apart on prepared baking sheet. Sprinkle cookies with remaining sugar. Bake for 7-9 minutes until cookies are set and bottoms are very lightly browned. Cool 1 minute, then remove from baking sheets to cooling racks. Cool completely. Makes about 15 dozen small and adorable cookies. This is so cute. Thank you for sharing the great idea! Love this! My grandson will love making these with me! I love it is an eady revipe but comes out so very cute! Thank you for sharing! Our grandkids always come to our house for Halloween so I will be making some of these. Thank you Jacquelynn for the recipe. These will be in my recipe box from now on! They sound wonderful can’t wait to make them with my grand daughters!